Home > Mysteries > Space > How Much Does a Good Telescope Cost? Stargazing got your head spinning? Telescopes are pricey and complex instruments, so you want to make sure you get one that you can operate and that will meet your needs. Depending on the type of scope that you buy and your skill level, you’ll be able to use it to see and identify different objects in the sky. Read on to eliminate any confusion you may have before buying a telescope. Telescopes use an eyepiece to examine details that are gathered with light, brought into focus and formed into an image. Telescopes gather more photons (particles representing an amount of light or other electromagnetic radiation) than the eye can, so they allow you to see fainter objects than can be seen with the naked eye. Smaller details surface in the images because the objects are magnified. Each telescope operates a bit differently and has its own specific set of instructions. The more complicated a telescope is the more important it is that you read the instructions, especially if you are beginner, so you know how to use it. By reading the instructions you will get the most out of your telescope. Depending on the type and size of your telescope, you might be able to see stars, the planets, moons, or even nebulae and other astronomical objects. What do you want to do with your telescope? Do you want to observe or photograph objects? Do you want a stationary or portable telescope? Do you want to see just the stars, or observe far away planets and fainter images? There are three types of telescopes: refractor, reflector and catadioptric. Learn the differences below. Refractor telescopes are the oldest form of telescopes, created by Galileo in the early 1600s. The main light gathering component in refractor telescopes is the lens. It is located on the sky end of the scope, and light is focused out of the back-end (at the bottom of the tube). Light is refracted by a curved lens, which is how you are able to see into the sky. Refractors are great for lunar and planetary exploration and deep-sky astrophotography. Reflectors were invented in 1668 by Sir Isaac Newton. The primary light gathering component on these telescopes is a concave parabolic mirror. A secondary flat mirror is used to change the light path so you can view the image at a more convenient location. Most reflector scopes are designed with an open tube with the primary mirror at the bottom end. Light comes in at the top of the tube, hits the primary mirror and reflects to the secondary mirror, which directs it out of the side of the tube for you to view or photograph. Catadioptric telescopes use both refractive and reflective elements. A mirror is the primary light gathering source, and the secondary mirror is used to magnify the light and send it to the bottom of the tube. There is also a lens at the front of the tube to correct abnormalities. The attributes of a telescope can be a bit overwhelming for a beginner. How do you know what aperture is best, or how to determine focal ratio? We’ll teach you about telescope terminology here. The size of the opening in a telescope where the lens or mirror gathers light. It’s an important factor because telescopes are all about light gathering. The larger the aperture, the more photons are collected. 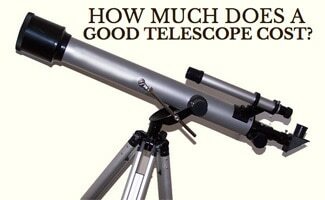 In addition, the larger the aperture, the higher the price, weight and size of the telescope. Aperture is measured in millimeters or inches (25.4 mm = 1 in). The distance from the objective lens or mirror to where the light becomes in focus. The longer the focal length, the larger the image is at the focal plane, and the higher the magnification is for viewing. Longer focal lengths are good for small objects (planets, double stars, etc.). Focal length is also measured in millimeters or inches. To get the focal ratio, take the focal length and divide it by the aperture. For example, if a focal length is 800mm and aperture is 100mm, then the focal ratio of 800/100 = 8 or f/8. A fast focal ratio is typically considered to be f/4 or less. Mid-range focal ratios are f/5 to f/8 and slow ratios are f/9 and greater. The faster the focal ratio, the faster the image is recorded. Named after Peter Barlow, it is a diverging lens that increases the effective focal length. Want to make your own telescope at home? Find out how to make one by watching this video. The Hubble Space Telescope was launched in 1990 and has provided beautiful pictures that fill us with awe, and data to help us learn more about space. Telescopes allow us to explore beyond our own world and see what else is out there. Now that you know how to find the best telescope for your needs and skill level, check out our review to find out which is the best telescope for you. What do you want to look at through your telescope?